Kirk Penney recorded a season high 20 points but Sevilla still went down 91-83 at home to Laboral Kutxa in the Spanish League. Penney struck 5 times from 8 attempts from behind the three-point arc but his effort couldn’t lift Sevilla who still languish in 17th place on the Liga Endesa table with an 8-20 record. La Bruixa d’Or Manresa were also defeated, losing on the road to UCAM Murcia 83-72. Isaac Fotu played 25 minutes but only put up three shots from the field in accumulating 7 points (2/3FG, 2/4FT). 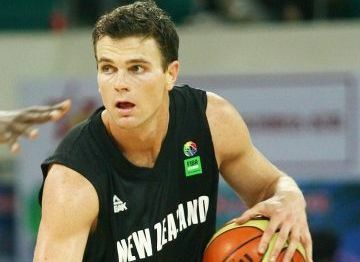 The Kiwi forward added 4 rebounds and 2 assists. Manresa also has an 8-20 record – next week will be interesting, Penney and his Sevilla team visit Fotu’s Manresa outfit. Corey Webster showed good form at the weekend for his Serbian club Mega Leks, Webster knocked down 17 points against Bayern Munich, the Germans squeezing a victory 88-81. Both clubs have a couple of weeks off before contesting their respective Serbian and German play-offs. Mega Leks head to Greece and Bulgaria for friendly fixtures during the next couple of weeks. The Oklahoma City Thunder is locked in a battle with the New Orleans Pelicans for the 8th spot in the NBA Western Conference. The Thunder broke a four game losing streak with a much-needed 116-103 victory against the Sacramento Kings on Saturday. Steven Adams secured 11 rebounds for OKC and added 6 points and 4 blocks. Despite a career high 54 points from Russell Westbrook the Thunder lost 116-104 to the Indiana Pacers on Monday. Again Adams had double figure rebounds (10) in addition to 4 points and a block. Following 8 straight defeats Errin Rooney’s club Arras finally secured a win in the French League. Arras finished 7th at the end of the regular season and faced 6th placed Tarbes home and away in a 5-8 placing play-off game. Unfortunately the second leg didn’t go so well for the Canterbury guard or her team. Arras managed just 10 points in the final quarter losing 79-60. Rooney had a horror shooting night converting just 2 from 13 shots, finishing with 4p/7r/6a. It is unclear at this stage if the season is over for Arras or further classification games remain to be played.